There are approximately 9,057 open terrace eateries in Paris. It is expensive to live in Paris. It is ranked as the fifth most expensive city in luxury housing, but 62% of the buildings date back before 1949. Paris is the capital and most populous city in France. It is located along the Seine River in northern central France. The population in 2016 is estimated to be as much as 2.34 million. The population of the city of Paris reached a historic high of 2.9 million in 1921 but then declined; between 1954 and 1999 it declined at every census, falling to 2.15 in 1999, but after that it began to climb again. Paris covers an area of 105 square kilometers (41 square miles). Paris is spread widely on both banks of the river Seine and includes two islands, the Île Saint-Louis and the larger Île de la Cité, which form the oldest part of the city. Overall, the city is relatively flat, and the lowest point is 35 meters (115 feet) above sea level. Paris has several prominent hills, the highest of which is Montmartre at 130 meters (427 feet). There are still a few houses from the Middle-Ages in Paris. They were restored in the 1970s and date back to the 1400s. Paris was founded around 250 BC by the Parisii, a sub-tribe of the Celtic Senones. They settled on the Île de la Cité and on the banks of the Seine, built bridges and a fort, minted coins, and began to trade with other river settlements in Europe. In 52 BC, a Roman army led by Titus Labienus defeated the Parisii and established a Gallo-Roman garrison town called Lutetia. The population of Paris peaked in 1921 at 2.9 million. Today this number is less, with approximately 2.2 million residents living in the city. The town was Christianised in the 3rd century AD, and after the collapse of the Roman Empire, it was occupied by Clovis I, the King of the Franks, who made it his capital in 508. In 987 AD, Paris became the capital of France. During the French Renaissance period, from the late 15th century to the early 17th century, Paris became a center of art, architecture and science. Paris' oldest bridge is the Pont Neuf. Pont Neuf means 'New Bridge' in English. In the mid-1800s, Napoleon III hired civic planner Georges-Eugene Hausmann to modernize Paris. Hausmann’s designs gave the city wide, tree-lined boulevards, large public parks, a new sewer system and other public works projects. From 1940 to 1944, the city of Paris was occupied by the Germans. By 1942, there was a massive deportation of French Jews and by 1944, the city of Paris is liberated by the Allied Forces. The last Nazi commander in charge of Paris famously claimed he saved the City of Light from an insane Hitler who wanted it flattened. A French historian, however, told The Local that version of events is pure fantasy from the self-aggrandizing former general. The name “Paris” is derived from its early inhabitants, the Celtic Parisii tribe. During WWII the Mosque of Paris gave Jews Muslim IDs to help them avoid being murdered by Nazis. Paris is often referred to as The City of Light (La Ville Lumière), both because of its leading role during the Age of Enlightenment, and more literally because Paris was one of the first European cities to adopt gas street lighting. In the 1860s, the boulevards and streets of Paris were illuminated by 56,000 gas lamps. 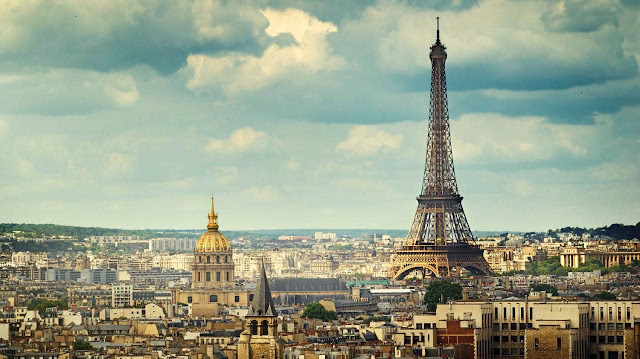 The city of love, fashion capital, literary paradise, a city know by many monikers. Classic, innovative and offbeat, the capital offers a unique cultural journey through 1,803 monuments, 173 museums and many other exceptional places. The Eiffel Tower may be the most famous monument in the world and is certainly the most emblematic of Paris. It’s hard to believe that the structure was dismissed as a monstrosity when it was first unveiled. The Eiffel Tower was designed by Alexandre-Gustave Eiffel and built for the Paris Exhibition of 1889, which marked the centenary of the French Revolution. The tower consists of 15,000 steel sections held together by 2.5 million rivets. This innovative structure is now considered a masterful architectural feat and is one of the top tourist attractions in Paris. When Hitler arrived in Paris during WWII the French did not want him visiting the top of the Eiffel Tower so they cut the lift cables. If he wanted to reach the top he would have had to climb more than 1000 steps. He chose not to make the climb. Most people in Paris rent, with only 33% of Parisians owning a home in the city. The Louvre or the Louvre Museum is the most visited and famous museum in the world. The museum is housed in the Louvre Palace, originally built as a fortress in the late 12th to 13th century under Philip II. Leonardo da Vinci’s Mona Lisa is undoubtedly one of the most famous pieces of art in the Louvre, with people from all walks of life travelling to the museum to catch a glimpse of the world famous painting. Paris has approximately 1,784 bakeries. The Parisians are known for their pastries and cuisine. Notre-Dame Cathedral stands in the heart of Paris on the Ile de la Cité. The cathedral is widely considered to be one of the finest examples of French Gothic architecture, and it is among the largest and best-known church buildings in the Catholic Church in France, and in the world. Built between 1163 and 1345, the Notre Dame Cathedral is also one of the most visited religious buildings in the world: it has more that 13 million visitors per year! Paris has 6,100 streets. The shortest street is Rue des Degres at 5.75 meters. Only one STOP sign exists in Paris. People are expected to give the right of way to the person on the right. The Arc de Triomphe is one of the most famous monuments in Paris. It is dedicated to the victorious French armies of the Revolution and the First Empire. The triumphal arch is in honor of those who fought for France, in particular, those who fought during the Napoleonic Wars. Built between 1806 and 1836, it’s iconic in style and sculpture to the decoration popular at the first half of the 19th century and visitors can admire its delicate design and engravings. Paris' City Hall has been at the same location since 1357. The tree-lined Avenue des Champs-Elysees is Paris’s most famous street and has even been described as the most beautiful avenue in the world. Almost two kilometers (1.2 miles) long, the boulevard connects the Arc de Triomphe and the Place de la Concorde. Life in Paris centers around the Champs-Elysees. It’s an avenue lined with restaurants, upscale boutiques, museums and night clubs. It’s home to the Bastille Day military parade and the end of the Tour de France. Paris has a mild but moderately wet climate, but it does experience extreme heat on occasion. The Musée d’Orsay is a national museum in Paris, on the left bank of the Seine opposite the Louvre and facing towards the river. The museum is internationally renowned for its collection of impressionist art and is one of Paris’ top attractions. Each year approximately 22.4 million tourists visit Paris. One of the most noticeable landmarks in Paris is the striking white-domed basilica of the Sacre-Coeur. It is located at the summit of the butte Montmartre, the highest point in the city. This stunning basilica draws many tourists every year to see its marble architecture and gorgeous interior. The Louvre Museum in Paris is the most visited art museum in the world. There are 37 bridges within Paris. The Pont Neuf is the oldest standing bridge in Paris. It was built with interruptions in the work, from 1578 to 1607. The French Revolution started in Paris. There are about 6,100 streets in Paris. The Rue de Vaugirard, which at 4.3 kilometers (2.7 miles) is the longest street in Paris. At 3.3 metres (10.8 feet) wide and 5.75 metres (18.7 feet) long the Rue des Degrés in the 2nd arrondissement has the distinction of being the shortest street in Paris. There are also 450 parks and gardens in the city, spread out across more than (485 Hectares) 1,200 acres. The two most famous are the Tuileries Garden and the Luxembourg Garden. There are 470,000 trees in Paris, and every single one of them is documented, measured and referenced. There are more than 400 movie screens in Paris, a hundred of which are operated by France’s government art program, Art et Essai. Paris is home to some of the top bakeries in the world. There are approximately 1200 bakeries in Paris. Famous landmarks in Paris include the Pyramid of the Louvre, Arc de Triomphe, Palace of Versailles, the River Seine, and the Eiffel Tower. In Paris, the baguette is an indispensable part of everyday life. Paris has an estimated 40,000 restaurants! In France, the term haute couture is protected by law and is defined by the Chambre de commerce et d’industrie de Paris based in Paris. In the 1860s, an artistic movement known as French Impressionism emerged, featuring the work of a group of Paris-based artists that included Claude Monet and Pierre-Auguste Renoir. Paris is often referred to as the 'City of Lights'. In the 1920’s and 1930’s Paris was one of the world’s most important hotbeds of experimentation in art and literature. Salvador Dali, Pablo Picasso, and the “Lost Generation” of English-speaking writers like Ernest Hemingway, James Joyce, James Baldwin, Gertrude Stein, and Ezra Pound make Paris their home. More than 20 million people in total are said to come to this city each year. A dozen or so Japanese tourists a year have to be repatriated from the French capital, after falling prey to what’s become known as “Paris syndrome.” That is what some polite Japanese tourists suffer when they discover that Parisians can be rude or the city does not meet their expectations. The experience can apparently be too stressful for some and they suffer a psychiatric breakdown.